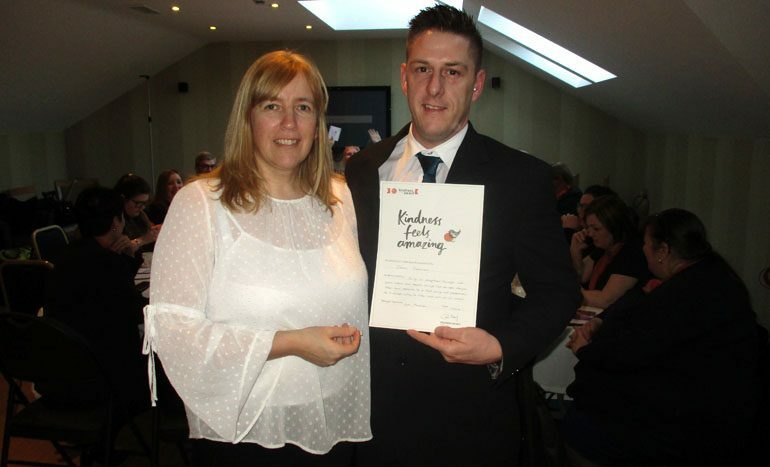 HC-One’s St Clare’s Court Care Home in Newton Aycliffe is celebrating the success of home manager Jason Parkinson, who has received a Kindness in Care Award for the great work he delivers for residents on a daily basis. The Kindness in Care Awards programme was launched by HC-One, a leading provider in health and social care, in October 2013 to recognise the efforts of their kindest colleagues, and the impact they have on the lives of residents and their loved ones. Last month, a record breaking 230 Awards were presented to colleagues, volunteers, and whole teams within the family of homes that HC-One operates across the UK. Jason was nominated for the award by a colleague, who highlighted his ‘kind, caring and professional’ approach. He was described as ‘an exceptional manager who goes above and beyond’, and someone who is ‘always willing to listen’. Jason was presented with his award by HC-One Area Quality Director Mandy Falconer. Since 2013, over 3,000 HC-One colleagues have been awarded for their commitment to kindness with nominations invited from Residents, relatives, colleagues or visitors to the home. HC-One aims to be the first-choice care provider in each of its communities for Residents looking for the very best care and support, and the employer of choice for the best, most professional, and kindest care staff, with sector leading career progression opportunities. “I am delighted and humbled to have received this award,” said Jason. HC-One managing director Stephen Butterworth said: “The Kindness in Care Awards programme is about recognising and celebrating colleagues who demonstrate the kindest care and the best practice that we can all learn from, and St Clare’s Court has the privilege of having just such a colleague.